It’s summer and even though I want to eat gelato and ice cream every day, I know that would sabotage my weekly workouts. Eating healthy has always been the hardest part for me especially because I have a MAJOR sweet tooth. I’d rather eat cake as opposed to dinner lol. Below is a recipe I have been using for ages that helps satisfy my sweet tooth but doesn’t take away from my “gains” (idk why I can’t take that word seriously). There is a lot of variety you can add to these – if you don’t like chocolate chips, add caramel or butterscotch chips, even some pretzels…it completely transforms the flavor to whatever it is you like! See my version below! Put all ingredients in a bowl + mix! Shape into balls + refrigerate. I have been seeing Fab Fit Fun everywhere, so I took the plunge and first ordered the Editor’s box, which I received for only $20 or so. Truthfully, I forgot I kept the subscription, so when I was charged the $50 bucks for the summer box, I figured why not, let’s see what the hype is all about! For the $50 seasonal subscription, you receive a box of goodies ranging from beauty to fashion to fitness. The value of the box is worth more than $200, what a steal! When you initially subscribe, you fill out a survey, which is to help the FabFitFun team select products that are more in tune with your personal tastes. This does not mean the box is personalized however! To start, I LOVED the Editor’s Box! Check it out below! Two clutches in one? Yes, please! I received the blue/pink one. The vibrant color and fun summer pattern can add a pop to any outfit! I love that this had removable cooling inserts! Honestly have not tried yet, but only have heard amazing things. The papaya, pumpkin, + pineapple enzymes perfectly polish your face while the treatment also improves texture, pores, fine lines, and wrinkles. OKUR. The smell of this alone is just incomparable. I am OBSESSED with it. It exfoliates, cleans, and moisturizes! Love the way my skin feels after using it. Super cute, and perfectly fitting for my desk at work! Can’t wait to try this especially since summer has been hard on my hair between the heat, styling, salt water, sun, you name it! It certainly needs some hydrations and restoration. A perfect hot and cold pack for soothing any muscle aches and pains! Freeze or heat to the desired temp, and place where you need relief. Always good to have! And now for the Summer box! I also loved this one. I think they included the perfect necessities for summer! I have recently tried making everything I put on my body organic, and during summer, when sunscreen is basically the first thing you put on everyday, I was so happy to receive this! It feels great on my skin! Like I mentioned before, I LOVE tarte products! I actually have this palette and already used two of the colors so I was thrilled to receive a replenished one! First off, ONE bottle lasts SIX MONTHS. I am lucky if my face wash lasts me three weeks! This scrub brightens, cleanses, rejuvenates, and hydrates! Looks like I don’t have to leave mt house to feel like I went to the spa! This was the first thing I opened and tried. It was pretty cool to use and I was super happy to see that my skin age as my actual age! It is a silicone cleansing brush that features app-driven skin analysis. LUNA fofo analyzes the skin type and moisture level in each zone of the face to create a personalized skin profile. I am usually a strictly silver, simple jewelry person. Buuuut this has changed my views on pearls and gold. I love how unique it is. It has two certified natural cultured freshwater pearls and is 14K gold (real gold) plated! I love marble print, and I love this dish! The perfect addition to my vanity where I can place my rings and things, especially my new Erth ring! Following my organic preferences, this paraben free 10-in-1 thermal heat protection spray helps to fight potential damage caused by heat, UV rays, pollution etc. It helps protect hair, seal split ends, making hair shiny, soft, and smooth! Also, it smells amazing. Overall, I would definitely recommend FabFitFun! They have awesome, unique, high quality products in their seasonal boxes – all for a price you couldn’t even dream of. Totally worth it, go get yours! Abs are made in the kitchen. While yes, abs are made in the gym, what you make + eat in your kitchen is what will reveal them. Only about 30% of what you do in the gym will help with the abs, the other 70% is all about what you’re putting into your body. In this post, I will go over (and show you!) some exercises I do to help with my abs. I don’t have a six pack (I do have a sweet tooth 😉 ), but I do know these exercises are some of the best and will def have your abs burning the next day! I do abs about four times a week. I dedicate one day to all exercises on the stability ball, another day to solely planks, another day leg raises/cable crunches/Russian twists, and another day on just random ab machines. Happy Valentine’s Day sweethearts! 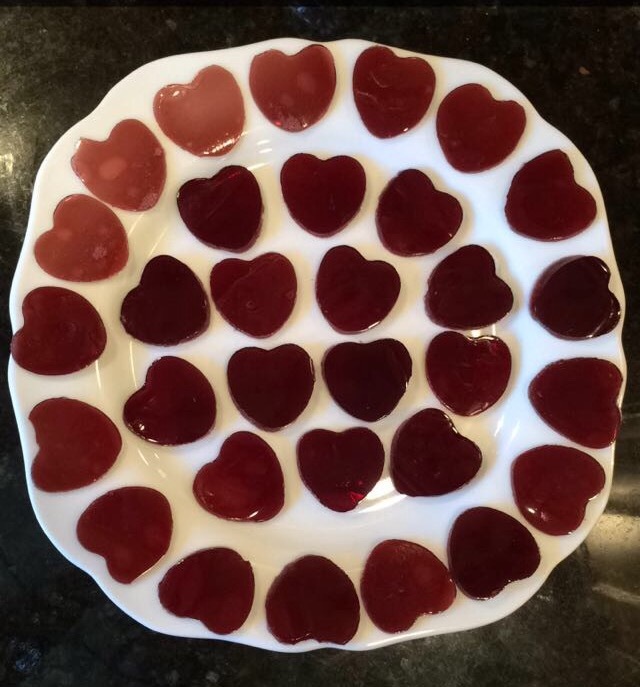 ❤ A day full of flowers, chocolates, love…and wine gummies? I think YES. I made these awhile back and actually posted this recipe for another blog, and it was a huge hit so I decided I will share here as well :). Tell the chocolates to stay on the shelves this year, because these are bound to be all the rage – especially if you’re a wine lover. Pour wine into a saucepan over low heat. Let heat up for about 3-5 minutes at this low heat, you do not want the wine to boil. Add 1 Tbsp. of gelatin at a time, whisking after each addition to make sure it is combined thoroughly. Add maple syrup to the sweetness you desire. Whisk it all together and remove from heat. Pour into long pan and let chill/set in fridge for 1-2 hours. Note: Once chilled some parts may look bubbly, simply just cut out your shape and flip it over for the smooth side. NYC temps have been sinfully low lately (more snow tomorrow!). I can’t believe just last week it was in the fifties and now we are lucky to see 25 degrees! Even though it is wayyyy too early in the season to put away the sweaters, it is never too late to add to the sweater collection ;). I always seem to get the most compliments on my H&M sweaters which makes sense because stores like H&M and Zara, etc. are all “fast fashion”. This basically just means it is trending styles of today for a cheaper price. I love (most) of their sweaters because aside from the trendy ones, they also have a ton of classic and basic looks that never go out of style. They are easy to get a bunch of different looks out of them and easy to just throw on. For times like this where I need some quick classic additions to my closet, H&M is an absolute go-to. Especially when all of these sweaters I only got for $15-$17 each! Since my style is pretty basic, I stick with more neutrals, and more simple looks as opposed to flashy glitz and glam looks. Sometimes I like to throw in a “wow” (to me at least!) or fun piece that I won’t wear too often but can get some cool outfits with. I like that H&M offers pieces like that that I can spruce up my closet with while not breaking the bank in the meantime. Here are some of the best finds I got at H&M over the weekend! Hello beauts! So I know we can all spend our paychecks in Ricky’s or Sephora or Ulta, or anywhere that sells makeup. There always seems to be a new product to try or a new beauty trend. I also feel like there a ton of beauty boxes out there that offer monthly subscriptions. I have tried Birchbox before since it was a gift from my sister, but I just felt like the samples were so tiny. What caught my eye about Ricky’s version of the monthly subscription beauty box is that it typically comes with one full size product. I also love that you get 25% off of all online purchases and free shipping on purchases of $50 or more. YASSSS. For only $11 getting ALL of that (retail value up to $50) seems like a steal in my eyes! For that price, it doesn’t even matter what is in the box, but it seems to always be something awesome 🙂 Check it more here. This is the review September – I plan on updating this post each month with what I receive! Opened it up to a little motivation! #CameToCrush everyday! Umm ok a mini straightener?! This is actually perfection. Tiny yet so powerful! I can throw this right in my purse for days I am running late and can just plug it in at work, and viola my hair is set! The plates are ceramic which helps leave your hair shiny, annnnd even more importantly, they heat up in seconds! Love love love! Alright so after summer sun and salty hair, this came in at the perfect time. I felt like my hair was looking so dull and dry and brittle. Not after using these bad boys. I seriously am going to have to get the full size versions. I also love that they are sulfate free and full of vitamins. Say what?! This is so unbelievably convenient – I remember my old company did some work with Z Palette and I kept saying I wish they would send us some so we can try, and now my dreams came true lol! This seemed to be a custom one for Ricky’s and I love it. It is so urban and hip. I love that I can customize my own palette with everything that I use – it is so helpful if I am doing my makeup on the go. Instead of lugging around my makeup bag, I can just throw it on my palette and shove it in my purse. Total win with this. I am a big advocate of Wella products – I used to work in a salon and everyone swore by it and since I got to test out the products first hand, I came to swear by them too! Sometimes my hair can get sooo flat, and since I typically straighten it, it doesn’t make for the best mix. I can’t seem to nail down that middle part with my hair pasted down like the Kardashian’s can haha. Sometimes I throw in a little volumizing powder but it makes my hair feel stiff and weird and doesn’t seem to work. I tried this once and my Jersey girl came out. Total life saver. After just one box, my final verdict is YES – totally worth it! For $11 the value is unbeatable. Fall is coming and I could not be happier! There is just nothing like sweater weather, crunchy leaves, apple picking, football season, and of course pumpkin spice everything. With the leaves changing and the weather getting colder, as we change our closets from tanks to over-sized sweaters, did you know you should also be changing your skincare routine?! While skincare routines should always include the staples (face wash, moisturizer, sunscreen, etc. ), it isn’t necessarily bad or detrimental to switch up the regimen quite often, especially when seasons change or hormonal changes occur. For example, with the colder months, my face tends to become dry very easily, but in the warmer months, my face is much more oily and I am sweating so much more, so certainly using the same routine won’t be effective for both instances. Multiple dermatologists agree that changing products way too often won’t give you the chance to see results you may be looking for since average cell turnover is 28 days. If only clear skin appeared overnight! So, as mentioned before, with Fall approaching, colder weather is approaching, and therefore my face is going to be drier than a desert :(. I decided to pick up seven different masks from Creme Shop and do a mask a day and see how my skin felt after each one. Basically, it felt as though I was going to the spa everyday, but the spa was my makeup room. Before we get into the masks though, let’s compare our faces to a painting. The paint will go on smoother and the overall results of the painting will look so much better if you’re working on a clean, smooth canvas right? That is why it is so important to not rely on just makeup removers and masks. After reading this totally amazing review on some of the best facial cleansers out there, I picked up this CeraVe Hydrating Facial Cleanser and I can honestly say I am obsessed. I have used it as my sole cleanser for this week’s experiment and I think it played a key role in my face feeling so soft and moisturized. I was wearing max coverage foundation and a full face of makeup, and this cleanser took it right off, without me going through an entire bottle of it. Can you say yes please?! Unlike harsher cleaners that exfoliate and really remove the skin’s protective barrier (this is why you should only exfoliate 1-2 times a week! ), this cleanser actually helps to restore that protective barrier as well as keeps the skin’s natural moisture. My face feels so soft and looks nice and dewy immediately after washing. Since my skin is nourished and moisturized all day long, I’ve even noticed that my foundation stays on better throughout the day, and that’s without me using primer (when I go to work, I don’t wear much makeup, so I nix primer from my routine – I try to let my skin breathe during the week). I love love love this product and can’t wait to continue using it and keep you updated! Dry skin and red spots be gone! Now back to our painting…I mean mask experiment! All of these masks are from the Creme Shop. Aside from masks, they also have beauty products from beauty blenders to eyelashes, something I never knew before. I guess I will have to save that for another post though! If you’ve read my previous post on Korean skincare, you know I am a huge fan and avid lover of those products, a Creme shop mask being one of them. All of these masks are made in Korea and deliver just as well as the other ones in that post! I tried seven masks, check out my thoughts on each of them below. This one is infused with hyaluronic acid (a main ingredient in the CeraVe facial wash by the way!). This is what keeps the skin’s thirst quenched, keeping it smooth and dewy! I also love that it is non-irritating, so for those of you with sensitive skin, definitely give this one a try. The design was adorable, and after I took it off after a half hour or so, my face felt so soft and looked so moisturized. Bye bye flaky dry skin! Another adorable “animated” mask! Who doesn’t love pandas, and who doesn’t love to fight aging skin early?! This one is infused with restorative bamboo extract and is rich in silica – which means it boosts structure and elasticity. I actually felt my face tingle slightly while using this one. My face did feel quite refreshed after using it. Alright so anything charcoal seems to be all of the rage in skincare, due to its ability to completely wipe away the impurities and dirt/oil on our faces. First off, I LOVED the smell of it as soon as I opened it up, definitely smelled like delicious lemonade (as I am literally drinking lemonade as we speak haha!). So this dual mask is designed to obviously be like a 2-for-1. As we know, charcoal lifts up toxins and dirt from the pores on our faces. Lemons have antibacterial properties that can help heal, brighten the skin, and combat blackheads. This mask is also filled with hyarulonic acid, making it full of moisture. I loved how this mask made my face feel, my face felt so clean and soft and looked so dewy. When I woke up the next morning, my mother (who is on me about skin ALL. THE. TIME), complimented how great my skin looked! Oh ,you can also refrigerate this mask for a cooling effect and feeling. Kale yasss! I can say I know a ton of ways to EAT kale, I didn’t know I could use it to help my face though! As we all know, kale is full of Vitamins, A, C, and K. It is a super food that helps our body, but it can also help with skin imbalances. It helps reduce bloat and puffiness, corrects redness, and can even help with dry patches/flakiness. This certainly helps with keeping skin toned and revitalized! I loooove pineapples, and now I love putting them on my face! I had no idea it had an enzyme (bromelain) that acts as an all natural exfoliator, breaking down the keratin protein in dead skin cells. This reveals a new layer of skin and helps get rid of discoloration, leaving you with bright and renewed skin. My face felt so soft after this one! This one had some serious powers like a witch haha! I wanted to try this one because it said it combats acne and blackheads and helps minimize excess oil production. It also said it helps against sun damage – a must have since summer is over. Apparently, witch hazel has a ton of healing properties such as reducing skin damage, inflammation, and swelling. the all-natural ingredient soothes troubled skin and balances the skin for an unblemished complexion. After I took this mask off, I felt like it wiped my blackheads away too, my face felt so smooth and looked so supple. PS – for a cooling effect you can refrigerate their masks 🙂 I haven’t tried, but if you have, comment below! If you’ve tried any, I’d love to hear which ones and what you thought of them! Could not be happier with my skin ❤ ! So my last post was April 3rd…I always tell myself I won’t allow any of these long hiatuses to occur, but here we are. A lot has gone on since April and between work and my personal life this took a back seat, but I am back – and what better way to come back with a nostalgic post about Spain?! Around this time two years ago I was travelling all over Spain, loving every second of it, even the historical heat wave we faced in Madrid (well, maybe not that part). Spain was absolutely beautiful with such an incredible culture and people, so I cannot wait to share these images and stories with you! Our first stop was Madrid. Beautiful beautiful Madrid! I have never been to Spain before so I wasn’t too sure on what to expect, but I was pleasantly surprised. Throughout all my European adventures, I have never seen such detailed architecture before. The plazas were extremely large, much bigger than the ones I saw in Italy. The nightlife was unmatched – watch out NYC, they are the true city that never sleeps…well, aside from the whole siesta thing (yes it is real!). Literally everything shuts down during siesta time, I had extreme trouble finding even a convenience store to just grab a bottle of water! I loved exploring everything Madrid had to offer, from the museums, to the parks, to the flamenco dancing, and of course the tapas and wine! They also have great trips available to places like Toledo (so sad we didn’t get to go!). I would definitely recomend renting a bike (we were able to do so at a gas station lol), see a flamenco show, and explore EVERYTHING. Don’t be afraid to get lost! Let’s start with some of the sites you can’t miss! The Palacio Real de Madrid (The Royal Palace of Madrid) is just breathtaking. The size alone will leave you in awe! No pictures are allowed to be taken inside but surely what you see will be engraved in your memory. The rooms are so beautifully (and ornately) decorated and full of indulgence, you could only imagine a king living here! They have gardens surrounding the place, making it hard to believe this is right in the middle of Madrid! They also have an armory full with an incredible collection, some even say the best in Europe. Plaza Mayor is a typical plaza full of street vendors and little stores, but what makes it so unique are the murals painted on the Casa de la Panaderia (Bakery House). the building was constructed in 1619 and as assumed, has undergone many renovations. It was originally designed to house the Baker’s Guild, which was extremely powerful as they controlled grain prices. the original paintings on the walls were redone in 1992, so pretty recently! It is now home for the Madrid Tourist Information Center, so if you are looking to get any information, this is the place to stop by! Also, typical to touristy areas, I would stay away from the cafes in the plazas, you can find a much more authentic and reasonably priced place one off the beaten path. Down to Andalusia we go! Marbella was a great way to relax on beautiful beaches and drink some tropical dranks after a bunch of touristy things (and a TON of walking) in Madrid. There were a ton of British and Russians there when I was there, I am not sure if they like to vacation there or if they kind of took over. Nonetheless it was absolutely beautiful. From the little stone pathways, the winding tiny streets. It reminded me of Sorrento or Cinque Terre. They had the cutest boutiques, the most quaint little cafes. I would totally recommend just walking around and getting lost and see what you stumble upon. They have wonderful ocean front dining and clubs at night right on the beach. I have honestly never heard of it before coming here, I assume places like Ibiza overshadow it, but it seems pretty family friendly too as I saw a ton of families with young kids! We literally just ate, drank, and relaxed on the beach during our time here, we didn’t do much exploring at all. Our final stop before heading back to Madrid to go home! And WOW, what a way to end a trip of a lifetime! Granada was just breathtaking, from the 1000 year old Alhambra and the views, to the wonderful markets and vendors, to the Turkish baths, to the modern shopping and dining, Granada has it all. I will certainly be adding more pictures as I unearth them from my computer, but the views I was able to capture from the Alhambra Palace are literally nothing like I have seen before. It was totally worth the trip to see and explore the grounds here. It truly felt like I was time warped to the past. This is another city with a ton of winding little alleys and streets that you should get lost in. It also had a very Arabic feel, with Arabic restaurants, vendors, etc. Completely different vibe and energy form Marbella and Madrid and anywhere I have been really. Loved every second of it. Also, though there are no pictures here (we weren’t allowed to take them), of the first Turkish baths in Spain, I highly recommend going. After a long trip of travelling and walking around, see and learning and being apart of this awesome history was just incredible. The baths were beautiful and clean, and we got massages after! Amazing work being done by hand in the palace. Okay, so it has definitely been a hot minute since I’ve blogged, buuuut it’s the holiday season and that has been my excuse for absolutely everything. Over the holidaze, I love love love baking cookies. This year I made twelve different kinds – yes you read that correctly. It was an expensive and fattening weekend to say the least. One of my favorite kinds to make are sugar cookies simply because decorating them is so much fun and I really get to be creative. However, in my baking experience I noticed that so many sugar cookie recipes end up with me toiling in the kitchen rolling out the toys and making the perfect thickness of cookies just for them to expand in the oven. I need clean edges! Then, my life was changed and I stumbled upon a recipe and tweaked it a bit to make it perfect! Enjoy! 2 sticks butter, unsalted, COLD. I also suggest slicing the butter at each Tbsp. mark as it will be easier to mix. 4 cups flour – be sure not to pack it when measuring! 3/4 cup cornstarch (this is the secret trick! Instead of baking powder, this will insure it doesn’t rise and leaven and spread). Preheat oven to 375 degrees. Line cookie sheets with parchment paper and set aside. In large bowl, cream together the butter and the sugar. Once combined, add eggs and mix on low speed until smooth. You don’t want to mix too fast and potentially melt the butter. Add flour, cornstarch, salt, and vanilla. Mix on medium speed until all comes together. It may seem like an eternity but I promise it will all come together. Flour a clean space as well as the rolling pin and roll out dough to 1/4 inch thickness. Use your cookie cutters and keep repeating this process until all the dough is used up! Cook for 8-11 minutes. They won’t really brown, so be careful not to overcook them! Let cool and then decorate with icing and sprinkles. Here are my Christmas ones below!